After long and loyal service, the 'Esvagt Gamma' and the 'Esvagt Promotor' have now left the home port ‘Dokhavnen’ in Esbjerg for the last time. After long and loyal service, the 'Esvagt Gamma' and the 'Esvagt Promotor' are now embarking on their final voyage; around 300 nautical miles to Fornæs Ship Recycling in Grenå. "'Esvagt Gamma's last job will be to tow the 'Esvagt Promotor' to Grenå. 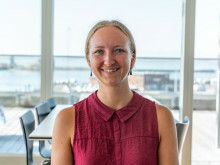 This is the kind of job the 'Esvagt Gamma' has been performing up to now, so it is the obvious solution," says Kim Roesdahl Petersen, Fleet Manager – Technical. Before scrapping, ESVAGT has removed any elements that can be of value to the rest of the fleet, for example oil spill equipment, spare parts and consumables. "We are removing any items of value that are not essential for the voyage to Grenå. When the vessel arrives, we will remove the last items,” says Kim Roesdahl Petersen. ESVAGT has used external suppliers to make an inventory of hazardous material – materials that need special monitoring during scrapping for safety reasons. "This is the safest way of doing it – and that is how we work at ESVAGT,” emphasises Kim Roesdahl Petersen. DOOR OPENER: The 'Esvagt Promotor' and the 'Esvagt Gamma' have played important roles in forming the ESVAGT that we see today. 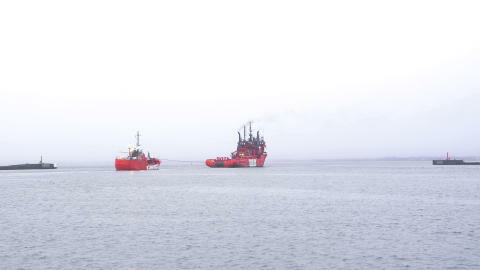 After many years of service for the shipping company, two significant vessels are now leaving the ESVAGT fleet for good. "Svitzer gained the owner's share of ESVAGT at the beginning of the 1990's and one of the vessels transferred to the ESVAGT fleet was the ’Promotor’, and the ’Esvagt Gamma’ was the first vessel that offered more than standby and supply services; two significant impacts on ESVAGT's history," says Ole Ditlev Nielsen. "With the ’Esvagt Gamma’, ESVAGT started working in completely new business areas. We moved from ensuring people's safety to also supporting production, for example, hose handling, front line oil spill contingency, emergency towing of tankers – tasks that were critical for the business," says Ole Ditlev Nielsen. "The ’Esvagt Gamma’ became a spring board for other similar tasks, and as such for ESVAGT’s first new build in 1999 that was specialised to perform a new type of service," says Ole Ditlev Nielsen. Apart from its daily duties as standby and supply vessel, the ’Esvagt Gamma’ has been actively involved in several rescue operations. The most remarkable mission being the rescue of M/V Schieborg in 2005 where ’Esvagt Gamma’ and ‘Esvagt Omega’ in a joint effort saved the lives of 15 people. HISTORY: The 'Esvagt Promotor' and the 'Esvagt Gamma' are now history – the learning lives on. "With these vessels, we built up competences and learnings that cannot be overestimated. The ’Esvagt Gamma’ and the ’Esvagt Promotor’ have both played a large role in making us the agile and competent company that we are today. We have worked with vessel operations, rescues, rig moves, anchor handling, cargo transfers, standby duties – pretty much everything. The work done by the ’Esvagt Promotor’ and the ’Esvagt Gamma’ have been important elements in ESVAGT’s development progression," says Steffen Rudbech Nielsen.